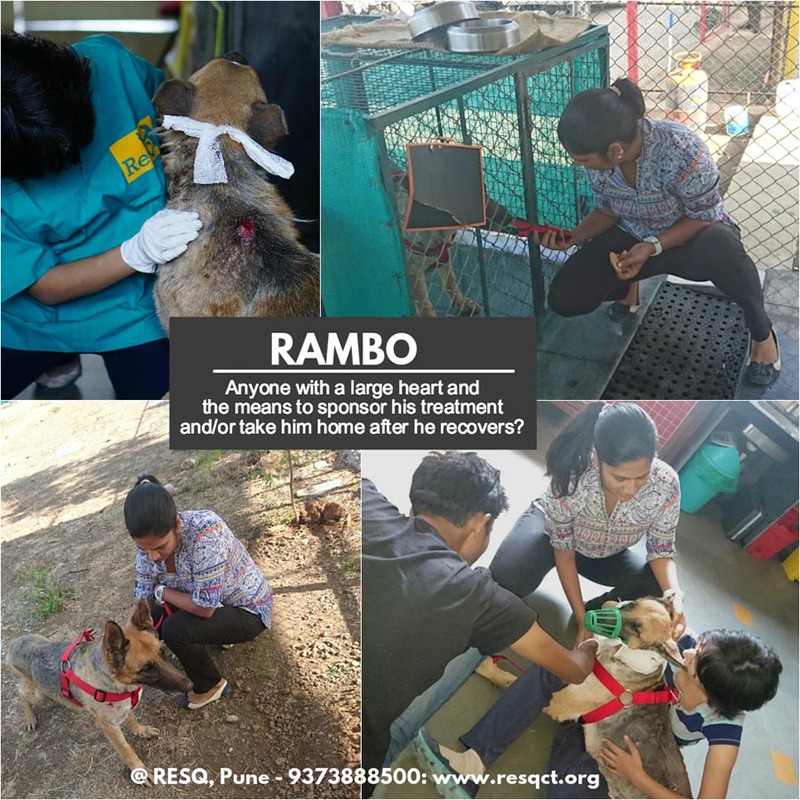 Rambo: approximately 6-7 year old male German Shepherd found hurt and abandoned near Pashan Lake, Pune yesterday. He is being currently treated at the RESQ centre and will need about 1 month to recover from his wounds. He was aggressive yesterday when we were trying to treat him, which we believe is because he is in a new unfamiliar place with lots of dogs, new people and is in pain. In the picture, Tanya Kane, one of the founders of RESQ and also a Canine Behaviourist, working patiently on Rambo, who surprised us at the end by getting into a great mood, coming out for a walk, eating treats happily, and allowing to muzzle on and off. He was not happy during treatment time but Tanya believes he will get better everyday! We feel it is our responsibility to not just treat an animal, but to try and modify undesirable behaviour traits so the animals have a better chance at re-homing and acceptance of humans incase of strays who are being released back on the streets.